Provide your backyard birds a majestic feeding spot with the Heath Grand Palace Caged Bird Feeder. This ornate, caged unit allows you to feed your favorite small birds, while deterring squirrels and larger birds from dining. A band of metal curls surrounds the top section of the cage, and bronze tones throughout this area gleam in sunlight for a striking effect. The 1.375" square openings on the grid offer passage to smaller birds, and a solid metal top and orb complete the unit. A 2.75" diameter seed tube rests inside this metal frame, easily holding 0.8 quarts of cracked corn or safflower seed. The four, reinforced metal ports help birds reach their treat, and a perch on each port offers them a resting spot. A raised base on the seed tube forms a baffle, preventing a dirty residue, and a metal tray at the base provides extra dining spots. The item disassembles for thorough cleaning, and a top loop makes hanging the piece simple. Its plastic and metal construction is great for seasons of use, while the clear reservoir helps you monitor seed levels at a glance. 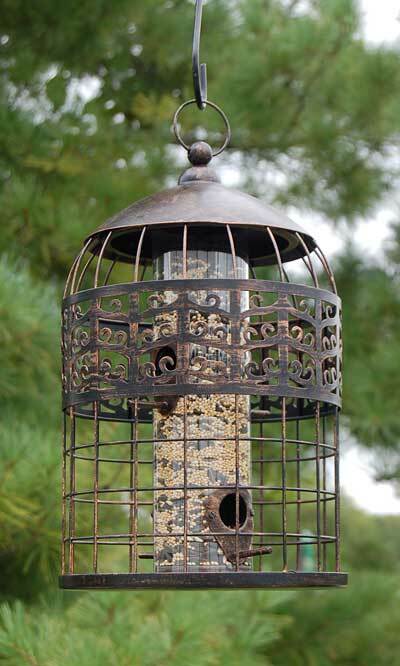 Place a remarkable feeder in your garden with this Grand Palace Caged Bird Feeder.